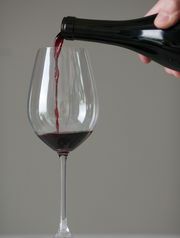 Wine drinkers often overpour, study says. Duh. People who drink wine often don’t know how much they are consuming, researchers at Iowa State and Cornell universities found in a new study. Though the National Institute on Alcohol Abuse and Alcoholism says a standard serving is 5 ounces, varieties of wine glass shapes, sizes and colors make it hard to keep track of just how much goes into a glass. “We all know that even though we believe we’re in control of our own behavior, often cues in the environment influence how we consume,” said Laura Smaradescu, an Iowa State marketing professor here and co-author of the study. The study, published in Substance Use and Misuse, found that participants poured 12% more wine into a wide glass than a narrow one. They also poured 12% more wine into a glass they were holding, compared to one placed on a table.